Cold Faith is a fine observation of how people respond to dire circumstances and how they do so in different ways. The title itself is a clever allusion to one of the central characters. In this, Webb explores what happens to people who have limited information about their world and how that world adheres to their central beliefs. Like all good speculative fiction, Webb has placed very human characters into a world very different from the one we are familiar with and then allows us to observe how they cope, or don’t cope, with this. We, as readers, can be sympathetic or judgemental about how they respond to the situations they find themselves in. I enjoyed this book very much. It hit a lot of the right notes for me in terms of description, character development, world-building – and the twist at the end was great! Another point in Cold Faith’s favor – no romance shoe-horned in! And, to be honest, the (almost) hopeless ending is a personal favorite of mine. Not every story needs to end with rainbows and unicorns. There is something kind of exhilarating about diving into a book which you barely know anything about, and that certainly reflects my feelings when undertaking ‘Cold Faith’. And as indicated in my 4.5/5 star rating I certainly felt it was a risk worth taking. If you are on the fence about reading this, let’s hope my review nudges you in the right direction. The overview of this story was what initially intrigued me; I have a huge weakness for anything remotely related to post-apocalyptic worlds and this fitted the bill perfectly. Picture the scene; earth has been twisted into an unrecognisable mess of a planet after an extended volcanic winter – cold has infected everything and a toxic fog means that even the stars are no longer visible. Our protagonist, Rab, lives in a small dying village which can barely manage to sustain itself against depleting food stores and the harsh weather conditions. Knowing this, Rab plans to journey north in search of a rumour of salvation – a city which has ships to carry its passengers to an undamaged planet. What he hadn’t planned for was the addition of the three remaining children of his village (Gift, Stitch and Fin), whom the village elder has thrust upon him to accompany him on his mission. Along the way, they stumble across a huge underground complex where, unbeknownst to Rab and his village, other humans have lived against the perilous cold. This is where they meet Sunny, a mysterious and ruthless woman who knows more about the fabled city than she is willing to tell. With all the lies and secrecy surrounding the past, can Rab possibly find a way to secure a more concrete future? I found the initial part of book very wordy and slightly overwhelming – there is little messing around as we are thrown straight into the midst of this ravaged world. However, the plot and the world itself are so creative and engrossing that this is wholly forgivable. It does take a while to get into any real action, but in all fairness it isn’t an action book and it was packed full of anticipation and adventure from start to finish. The details in the descriptions are extremely effective, you really experience the characters physical hardships against the unrelenting cold – it was amazing reading this in my armchair next to the fire. It was obvious that so much work and imagination had gone into this story, and as a result I would be very interested in reading more from Lafferty Webb. I was completely fascinated by the underground dwelling setting, it was immensely easy to picture and I have always really valued visual books like this. The plot itself was slightly darker and edgier than I had anticipated, and this was an unexpected plus; death, treachery and lies are all interwoven brilliantly into the story. There was an eclectic mix of ugly and admirable characters; the interactions between them were believable and I was thoroughly convinced by the dynamics – the author has a firm grip on who her characters are. In particular, I loved the tenuous but blossoming relationship between Rab and Gift, I found it to be truly heart-warming. I won’t say too much about the ending, except that it was simultaneously frustrating and brilliant. The final twist caught me by surprise, and I am already impatient for the next installment. ‘Cold Faith’ was a thoroughly enjoyable read, I was instantly tangled up in the world that Lafferty Webb had created and it was so refreshing to read something so new and innovative. A thumbs up from me, and I certainly do recommend reading this book. This book had me gripped from the beginning. It was one of those books that I just had to read one more chapter, and then one more! Looking back this quite surprises me really as not a great deal happened at the beginning – or indeed anywhere in the book! There are no “James Bond” type moments where the pace of the book picks up and gets exciting with lots of action. It just kept flowing along but kept me riveted all the way. There are many strong characters in this book which the author has put real effort into making very 3 dimensional. Rab makes the best of being lumped with 3 children and shoulders the unwanted responsibility. His relationship with Gift, a young girl aged around 5-10 is very different to that with the surly and argumentative Fin. Rab is a cautious and solid man. Gift, on the other hand, is quick and clever. She becomes a go-between placating the tempestuous relationships between Rab and Fin & later Rab and Sunny. I forsee great things for Gift in the future. Sunny on the other hand is very irritating and would argue black was white just for the sake of it! These different personalities and their interaction are what gripped me from the beginning. The plot itself is not unlike other post-apocalyptic type books. There is a general trend in this sort of book of seeking a better place & travelling throughout these barren landscapes. This is, however, better written than a vast number of these. The author doesn’t spend long periods of text explaining what has happened and how people have survived, we gain this knowledge by the descriptions of the people and places. The lack of sun and the endless diet of “‘shrooms” tells the reader a great deal about the environment and the way people lived without the need to explain it in detail. When Rab & his group arrive in the village/town that Sunny lives we learn more as they learn about the environment. The shared knowledge and traditions that the two unconnected places have tells the reader much more than would a full explanation. The author uses her vocabulary carefully putting much into few words. This is very definitely the start of a series. There are several unexplained events which are left open at the end of the book ready for the next one. I enjoyed it very much and shall be keeping an eye out for the next in the series – hopefully it won’t be long! Real page turner, great thriller. Very interesting book. It has great twists and turns. Readers will be drawn into the story from the very first page. 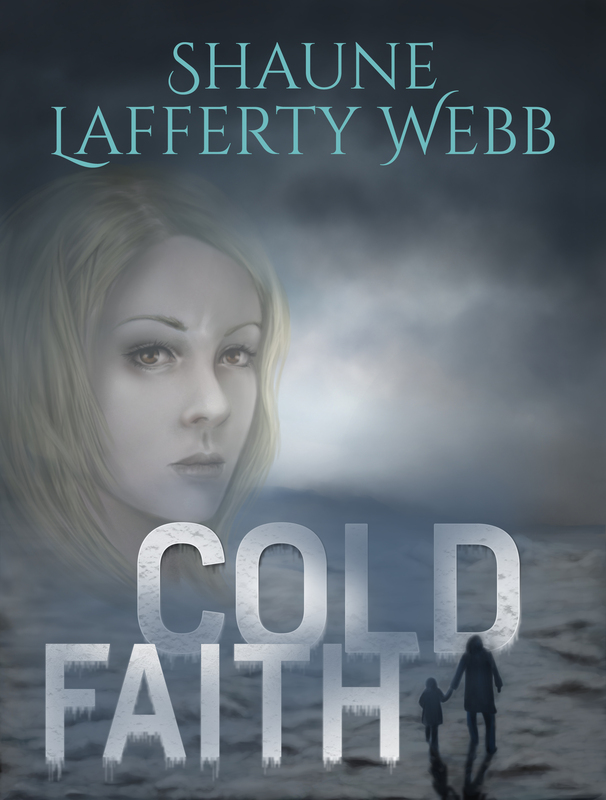 I really enjoyed Cold Faith by Aussie author Shaune Lafferty Webb. A blend of fantasy, dystopian and young adult I found it a quick, easy read; the characters are well fleshed out making it easy to get to know them. Sunny’s character was gritty and sometimes cruel; while Gift was a sweet, sensible and extremely astute child. Rab, as the main character, appeared to have the weight of the world on his shoulders. I have no hesitation in recommending Cold Faith highly and am keen to read the second book in the series. Great characters, frightening storyline. It doesn’t get much better than this. The only thing I can think of which would make it even more satisfying … a sequel available immediately. I will be following this author. This sci fi/fantasy book engaged my interest right away, with some sympathetic characters to root for, as well as some antagonistic characters to wonder about, and a well thought out setting. The author has set up some mysteries that keep the reader turning pages, wanting to know the answers. I think there may be a forthcoming series, and I hope there will be more books, as there are definitely things that could be explored and expanded on in this setting, and I’d love to read more. Another winning book for fans of well done sci fi/fantasy novels. Cold Faith is full of twists and turns. I was sucked in and couldn’t put it down until finished. I really hope there is a sequel. I especially like the surprises before Rab turns back and was on the edge of my seat by the end of the book. This can’t be the end. Oh, slow down…. Rab takes off from his village to look for something better for his people. He is forced to take three children with him, Fin and his little brother Stitch and Gift. He’d rather have gone alone but Blaze, who had given him the children, reminded him that the village was dying and he may be the only chance any of the children have of making it. The trip is full of danger. Little food, less wood for heat, and brown snow and freezing weather are some of the dangers they face. Stitch is too young to walk the long distances and Rab is forced to carry him for much of their journey. Stitch is hurt in an accident, suddenly there is a woman, who against her better judgement, offers to help Stitch but tells everyone else they can only stay in her village until he is better. A lot of action up to this point, but it only gets better from here! If a reader is looking for a book with an apocalyptic feel, twists, turns, danger, the struggle between life and death- this is the book to read. As previously noted, I really hope there is a sequel. I have to know what happens to those left behind! Definitely five stars! Post apocalyptic books nearly always draw me in, but this one even more so because the setting is the far future after an event. I enjoy reading about what happens after the canned food runs out. Also, as a retired middle/high school teacher, I am always on the lookout for books I believe students of this age would like to read. Still have contacts in the world of education, and this book is one I will definitely recommend for high school students.